During the past 12 years, 156 projects were implemented and more than 193,000 people were benefited in Asia-Pacific, Africa, Central America and South America regions. Our priority is placed in responding to the issues and needs of the field in an efficient and effective way. Only 40% of the urban slum population had access to shallow tube wells for their drinking water and other purposes. People defecate in open polluting water resources and the environment of the urban slums. 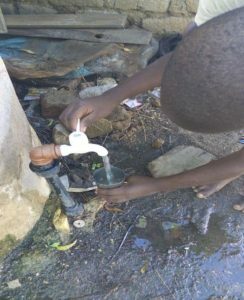 Poor sanitation, polluted water, and unavailability of potable water bring various water borne deceases such as Diarrhea, Cholera, and Hepatitis to the urban slums which are extremely disadvantageous to the accessibility to clean water and sanitation. １）10 Rainwater harvesting tanks were installed to 10 households each. ２）2 communal rainwater harvesting tanks were installed. ３）Communal sanitation facilities were renovated. ４）10 outdoor meetings on WASH and Hygiene were held. Because of these activities, the people in the slum area could use rainwater and sanitation facilities. Reduction of expenses to buy water and fewer water-related diseases were expected. 10 Rainwater harvesting tanks are appropriately operated and maintained by household users. They are satisfied with reduction of the expenses to buy water and being able to use water to wash clothes, utensils, etc. and for other purposes. Also, use of groundwater has been decreased. 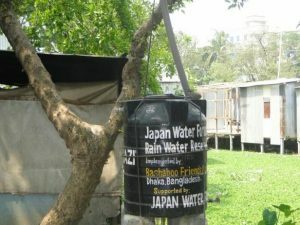 2 communal rainwater harvesting tanks are functioning well and managed effectively. Community people formed a committee through the participatory approach in maintaining the system for cleaning and using, with people maintaining the system on a weekly rotating shift. Renovated sanitation facilities are used cleanly by the community people. With the participation of community people, a committee was formed to maintain the system for general usage and cleanup on a weekly rotating shift. Now there is no stink. They are satisfied with their easy access to use the toilet. Besides that the broken pan and floor of the latrine was renovated. Positive changes among the beneficiaries are recognizable. They became aware of the use of rain water. Practices to promote better hygiene were introduced to the local community school, which inspired and motivated more than 400 students through the WASH program. I am personally satisfied with the household rain water harvesting system. I am getting the extra source of water for my household, which also reduces my water bill. I am a community leader. 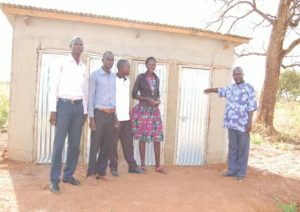 For a long time, there had been complaints from the community people about unhygienic latrines and WASH facilities. As two latrines were renovated and the communal rainwater harvesting system was introduced with the help of JWF, now they are pleased with the hygienic system and WASH program. No complaints were heard of and they are happy now. Rainwater harvesting system is the best solution. My kitchen is located too close to the toilet. So, when cooking curry, it smelled a stink of toilet. Now the problem is solved because the toilet is renovated. We can use and clean the latrine very easily. Now our living environment has become better than before. An adoption rate of the water and sanitation facility was 30% in major rural areas. The poor state of the water coverage made many people in the rural areas travel over 3 kilometers in order to access safe water. The sanitation situation was even worse, forcing a majority of the rural dwellers to use the bushes to defecate themselves. The poor sanitation in the area was likely to cause outbreak of tropical diseases such as cholera, typhoid and malaria. １） 1 sanitation facility was constructed. ２） 1 existing sanitation facility was renovated. ３） Training workshops on hygiene and maintenance were held. Because of these activities, the pupils, their parents, teachers and visitors of Alliance Nursery and Primary School could use improved sanitation facilities so that improvement of the school environment was expected. Constructed and renovated sanitation facilities were appropriately used by the beneficiaries who are participating in the routine of weekly cleaning. A subcommittee was made up of the parents, and the pupils are responsible in playing a cleaning-up role. They use local ash and chemicals for quick decomposition and drying of feces. Support and recommendation from the local government such as for a hygiene inspection and future actions as well as quarterly awareness creation and capacity building by the Health Department of the local government and other health serving CBOs have been continuing. The sanitation facilities are very comfortable indeed. We have an increased number of the beneficiaries of toilets, i.e. now about 13 in number comparing with previous 2. The attendance rate of the pupils at Alliance Primary School has increased. They have been attracted to the good sanitation and hygiene. Some minor management conflicts however emerged regarding the members’ obligation to the hygiene maintenance during holiday breaks when the learners are out of school, where whole responsibility should rest on the nearby community members. 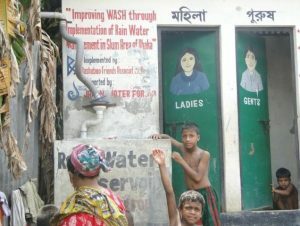 The sanitation facilities are very useful. 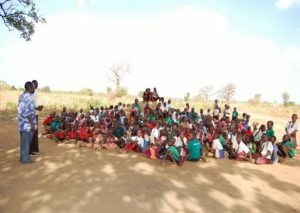 The community and the school registered some conflicts between the beneficiaries and non-beneficiaries. Due to scarcity of sanitation facilities in the area, non-beneficiaries also wanted to use the facility freely without providing any contribution to or cleaning the facility. However, the leaders have solved this locally. It was good for me too to support the project of Roco Paco as it improved a sense of well-being of my family. After the workshop, I made a rubbish pit, a toilet and a bathing shelter for my house, which reduced the rate and the number of poor hygiene-related diseases we used to suffer. In days past, our children used to get at least 7 cases of disease per term, which reduced to only 3 now. Information and knowledge (through their awareness creation workshops) boosted the involvement of people, local resource mobilization and hygiene maintenance; therefore, we have a healthy community with happy people. Residents of the Isandula, Irungu, and Ihimbili villages suffered from challenges of chronic shortage of clean and safe drinking water. Particularly in dry season, they relied on a dirty pond as their water sources. Women and girls in these villages traveled about 6km to fetch water from a well. It increased the risk of being sexually assaulted and deprived them of opportunities to go to school. １）1 bio-sand filter tank was installed in the community. ２）A training of making soap was held. ３）Workshops on the sanitation and hygiene awareness building were held. ４）Sanitary pads were distributed to girls in the village. ５）Club to take care of the tank and a village environment committee were established. Because of these activities, the community people could access to safe and clean drinking water so that improvement of women and girls’ life could be expected. The bio-sand filter tank has been well used and maintained by the local household’s members in the community and primary-school children. The RLEO team did not find any existing misunderstandings among them, which is presumably because of the workshop conducted on the facility rehabilitation skills and full involvement of the village committee that helps to maintain the facility smoothly when the need arises. People were happy to learn a simple way of making soap using local leaves that are abundant in the community. The village decided to plant more of such trees in March 2017. The workshop has improved student’s understanding on risks of open defecation and existing water related diseases. Currently students stopped defecating openly and are aware of good hygienic behavior and better sanitation practices such as washing hands with soap after using a toilet and before taking a meal. The club and the committee are still functioning well though sometimes the club could not continue some of its activities due to financial challenges. We got used to use the tank, and it works quite well. Before the installation and receiving training of the system, we women used to wake up in midnight and walk a long distance searching for safe and clean water for our families. 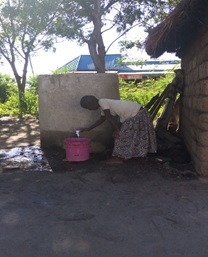 However, getting adequate clean water still remains a challenge in the village. I got used to the system and it helps us a lot. I don’t miss my studies at school anymore as in the past, and I have been attending school regularly with no problem. I think it is necessary in my village to expand the system so that people can spend less time waiting for filtration of the pond water they fetched. My family has been using it although sometimes my wife comes back home from the site with only a 5liter of water in her bucket. I could see changes in life of my wife and daughter. In the past they had a lot of troubles looking for clean water to meet my family’s needs. I think the biggest problem in this village is to keep adequate safe water during the hot season. Surrounded by the Kabal River, the Jindi canal and a tributary canal, the area is vulnerable to water-related natural disasters. In 2010, a large number of people of the village living near the bank of these canals were severely affected by the flood. Many precious lives as well as crops, houses and drinking water resources such as wells and hand pumps were lost due to the flood. Most of the poorest people are still living without clean water resources. １） 10 hand pumps were installed. ２） Drain pipes (50 meters each) were installed for each hand pump. ３） 10 wash pads were constructed. ４） 2 public awareness programs were held. ５）10 maintenance committees were established for each hand pump. Because of these activities, people in the village could use safe drinking water so that reduction of water-related disease could be expected. The installed hand pumps are functioning well and the maintenance committees take good care of them. 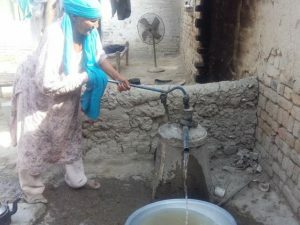 After completion of the project in 2015, the local people took an action on a self-help base / making contribution to install another 5 pumps, duplicating hand pumps of the project so that safe and clean water facilities could be installed near their doors cheaply. The water-borne diseases have been reduced by 60 % in the project area according to a local doctor. Members of the committee collect monthly money for maintenance and operation of the hand pumps, which are recorded properly for good finance management. 10 wash pads made of concrete for washing clothes each equipped with a hand pump and a drainage pipe are functioning well with no damages. Before the construction of hand pumps, we used to fetch water from an open well struggling a lot with long ropes. Every year, we used to spend too much money to pay hospital bills not knowing that the main cause of our health problems was polluted water, which badly impacted our health. But now we and our children can easily fetch soft and clean water from the hand pumps at our near-door well. After securing the access to clean and safe water by the installation of hand pumps, we are enjoying the safe and healthy environment and feeling a positive change in life. I found it very easy to fetch clean water safely from the well near my door. My family members can fetch clean and safe water for drinking and washing, also for our animals from these pumps which are working correctly. availability of hygiene education / awareness building regarding the clean and safe water issues in our area. and so on. 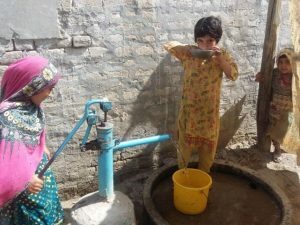 I have seen a positive change after the installation of hand pumps to provide clean water; that is, the ratio of water-borne diseases among women and girls was reduced. Previously, the women and girl patients of my clinic related to the project beneficiaries accounted for 80 %, and now it decreased to 20% . We would like to express our sincere appreciation to local organizations, JWF members, everyone who donated Cahrity for Water and all for your understanding and cooperation.